We offer weekly classes at various classes throughout Edinburgh, Midlothian, East Lothian and West Lothian (see class list for days, times & venues). 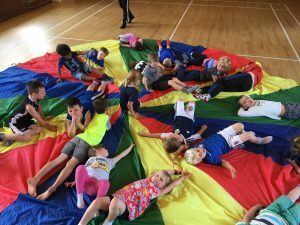 Parties are available at the weekends, where we take care of the kids for the duration (different packages available), we can cater for up to 30 kids. During the school holidays (Summer, October, Christmas, February & Easter) we take care of the kids with fun games, art & crafts, face painting, animal zoo, sporting games and give them well deserved snacks & drinks. Nursery & school sessions are more than welcomed. Learning in a positive, energy packed environment encourages children to enjoy sport. It is our ambition for every Bumbleebee child to enjoy sport for life. This is why our multi-sports journey also includes activities inspired by sport in the news for your child to discover sports over and above our core eight.